More than 30 people have been injured in a powerful suspected gas explosion that destroyed and damaged buildings in Wirral on Merseyside, the local ambulance service reported. Footage from the scene showed streets scattered with bricks and devastated businesses. “Wirral incident update: 30 ‘walking wounded’ patients (minor injuries) and 2 patients with serious injuries gone to hospital,” the North West Ambulance Service wrote on Twitter. It later updated the total number of injured to 34. The cause of the explosion in the New Ferry area of Wirral has yet to be confirmed, but Merseyside Fire Service said a suspected gas explosion was responsible for the incident. The explosion took place at 9:15pm local time on Saturday night. The devastated building was a dance studio called Complete Works, the Liverpool Echo reports. Lan’s House, a Chinese restaurant across a narrow street from the dance studio, also suffered damage in the blast, with reports of people rushing into a nearby pub with injuries. A second person in the pub told me earlier how it was like "something off the tele" - people rushing into pub covered in blood. 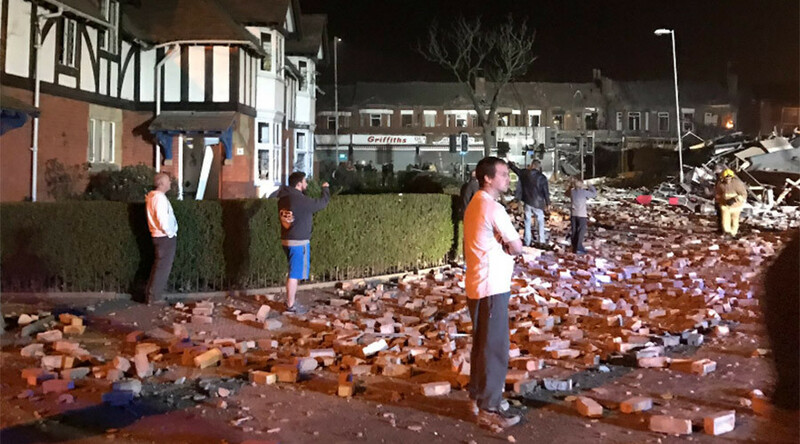 “Our emergency team in New Ferry, working with emergency services, have set up a refuge for people who have been displaced,” Wirral Council said in a tweet hinting at the scale of the blast. Photos from the scene showed ambulances rushing to help people. “Some people were under the rubble. It was horrific. Our whole house shook and we just saw a big cloud of smoke,” eyewitness Lew Hopkins told the Liverpool Echo. A spokesperson for the fire service confirmed they were dealing with a blast at two buildings covering an area of around 50 metres by 40 metres. “They have collapsed in a suspected explosion due to a gas leak,” she told The Independent. Local MP Alison McGovern described the situation as "very serious" and asked people to stay away from the area, while Wirral Council announced that they have set up a refuge for people who have been displaced. A woman who is understood to have attended the destroyed dance studio made an emotional post on Facebook following the incident. "Lost for words… I began complete work when it very first opened and to see it built, how it went and go from 20 of us to hundreds of them was incredible,” she said. "Vic & Kim put their heart and souls into that dance school and within minutes it has gone. Hoping everyone is safe." A JustGiving campaign, aiming to raise £10,000 for a new dance studio, has been set up. "Complete Works was a home to 100s of children taught by hardworking Kim McDonald and Victoria Charlton. A devastating gas leak destroyed the whole building and all its contents," the page reads. While the campaign has already attracted some two dozen supporters, its authenticity could not be immediately verified. Some reacted with suspicion, with Facebook user Stephen Morgan writing in the comments: "The dust hasn't even settled yet. Never mind the studio, let's just hope everyone is safe and well first!"